It turns out that all murals are not the same when it comes to photographing small sections of the whole. In my post where I explained my thoughts behind this "Molecules Of Art" project, I showed several examples from one mural I had photographed. That mural was painted onto a relatively smooth concrete wall with a very thick layer of paint. The next mural I have been working with has a very different substrate. 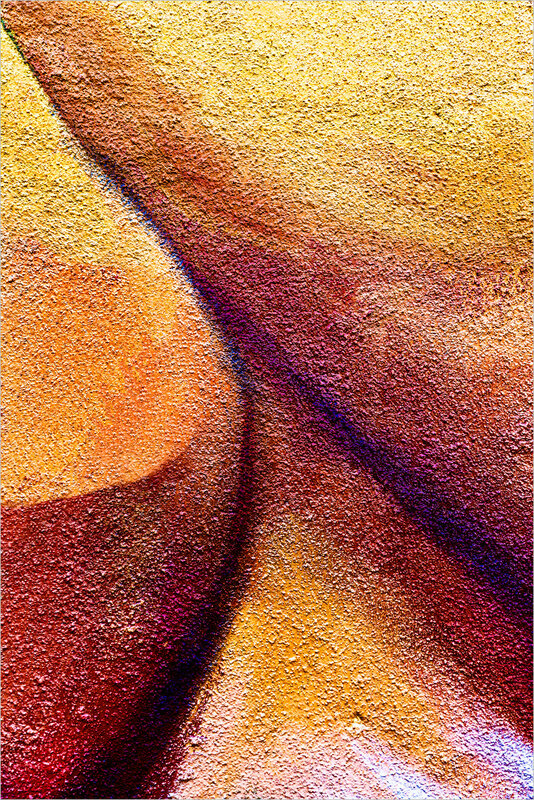 In this case the mural is painted on a very rough and textured concrete wall with a thin layer of paint, making the texture of the wall itself become integrated into the mural. In some ways the integrated texture makes the abstract nature of the image harder to work with, as I would prefer to direct the viewer's mind to the colors and shapes. On the other hand, maybe there is something different here. Maybe the texture just becomes part of the experience. Needless to say, I am still playing with these ideas.